Our deluxe queen room comes equipped with a queen size bed with plush bedding thus making it perfect for a business traveler or a couple. This room type comes with in-room coffee/tea, cable TV with HBO, wireless internet, heating, air conditioning, microwave, refrigerator, and more. 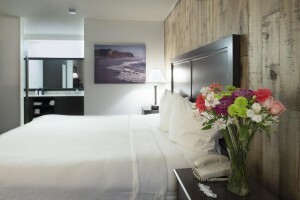 Our deluxe king bed is perfect for a single traveler or a couple looking for a larger bed while staying in Santa Cruz. This room type comes with in-room coffee/tea, cable TV with HBO, wireless internet, heating, air conditioning, microwave, refrigerator, and more. Our deluxe double queen can easily accommodate up to 4 people in comfort thus making it perfect for families. This room type comes with in-room coffee/tea, cable TV with HBO, wireless internet, heating, air conditioning, microwave, refrigerator, and more. If you are looking for a little bit more relaxation and luxury our king jetted tub is the ideal room for you. 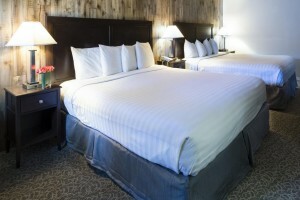 Lounge in your own private jetted tub while enjoying a relaxing night on a large king bed. This room type comes with in-room coffee/tea, cable TV with HBO, wireless internet, heating, air conditioning, microwave, refrigerator, and more. Our accessible queen is ideal for those looking for a room with accessible features and a roll-in shower. This room type comes with in-room coffee/tea, cable TV with HBO, wireless internet, heating, air conditioning, microwave, refrigerator, and more. Our 2 bed accessible room comes 2 full beds and is ideal for those looking for a room with accessible features with 2 beds and a roll-in shower. 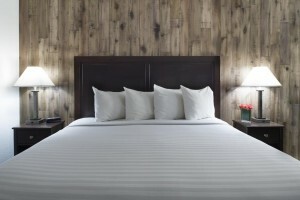 This room type comes with in-room coffee/tea, cable TV with HBO, wireless internet, heating, air conditioning, microwave, refrigerator, and more.